Disclaimers: This is mostly a quickie entry because I was cooking like the wind and neglected to take any step-by-step photos. So this is where your spectacular imagination comes in!! Really. Right now. Another note- I labeled this a vegetarian entry because the salmon could easily be left out or replaced with tofu or edamame. Here’s what we’re doing: MAKE NOODLES, MAKE SALMON, TOSS VEGGIES, DRESS AND SERVE. Let’s get started. Boil water and cook rice noodles according to package directions. Rinse and pat salmon dry. Top salmon with 1 tsp honey and sprinkle with jerk seasoning; set aside. Drizzle or brush the bok choy leaves with a small amount of sesame oil. Heat a well-oiled grill pan or saute pan over medium-high. Once hot, grill or wilt the bok choy leaves about two minutes per side. Remove to a cutting board and cut into pieces. Alternately, you could cut and saute in a saute pan for 3-4 minutes. Turn the heat in the grill pan down to medium. When it has cooled a bit, place salmon in pan skin-side down and cook for 5-6 before flipping. Since you have a few minutes now, you can whip up and dress the salad base. Toss the broccoli slaw, green onions, carrots if you’re using them, cooked noodles or rice, and bok choy in a large bowl. Drizzle with your dressing of choice and toss. Set aside. When the salmon is done, serve dressed salad in bowls and top with the lovely fish. Garnish with a few slices of avocado. This would be great with: cilantro, other salad greens, chicken, well-marinated flank steak, bean sprouts, more red cabbage or green cabbage… the list goes on and on. Just use what you have in the fridge. It will all work. This is man-hooking salad! LEMON SESAME VINAIGRETTE: 2 tsp sesame oil, 2 tsp sesame seeds, juice of 1 lemon, pinch of kosher salt, 1 tsp honey. Whisk together. Drizzle in olive oil as desired until emulsified. De. Lish. 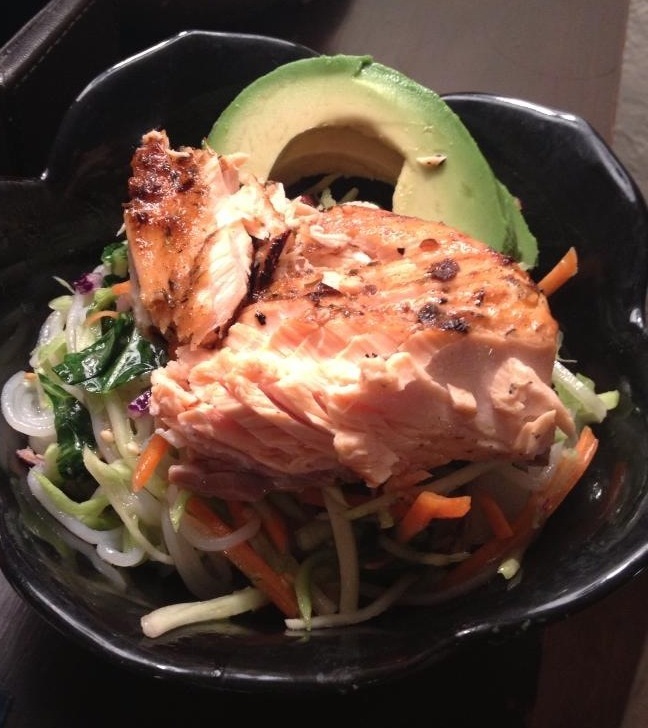 This entry was posted in Dessert, Easy, Fancy, Fast, Fish & Shellfish, Gluten free, Healthy Spin, Pasta, Pescatarian, Quickie, Salad, Vegetarian and tagged bok choy, homemade vinaigrette, lemon juice vinaigrette, rice noodle salad, salad dressing, salmon, salmon salad, sesame vinaigrette. Bookmark the permalink.